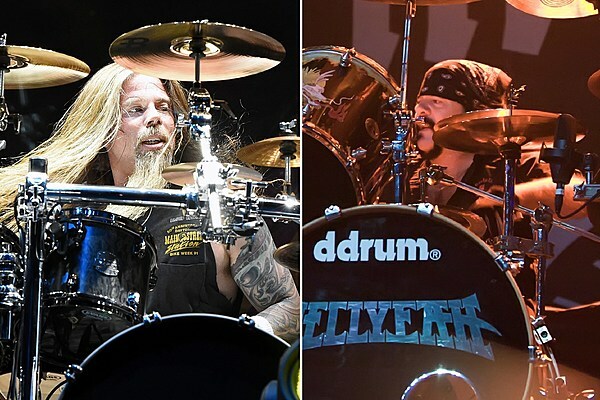 Chris Adler has revealed that he once had an in-depth conversation with Vinnie Paul about calls for a Pantera reunion. The Lamb of God drummer recalls telling Paul, "Please don&apos;t. It&apos;s not right." Pantera broke up officially in 2003 after Paul and his brother, Dimebag Darrell, came to the realization that singer Philip Anselmo would not be returning. Tensions had been high between the siblings and the frontman since the summer of 2001 when what would turn out to be their final tour ended. Darrell was tragically murdered onstage in 2004 while performing with Damageplan, the new metal outfit he formed with Paul. Since his death, there have been calls to reunite Pantera and have another guitarist filling in, with Zakk Wylde&apos;s name brought up most. "I spoke with him at length about that, not that my opinion mattered whatsoever, but I encouraged him, &apos;Please don&apos;t. It&apos;s not right,&apos; Adler tells Chris Jericho on the Talk is Jericho Vinnie Paul tribute podcast that premiered yesterday (July 4). "As much as I love Zakk, or whoever else might be able to do it, and I know the fans want that, and I know there is this concept of, &apos;Do it for the fans. Do it for the songs. Celebrate this,&apos; it&apos;s celebrated by the fact that it&apos;s over. It&apos;s celebrated by the fact that we all remember it well, with the appropriate pieces to the puzzle." "There&apos;s a chemistry you have as a band, and sometimes in my band it can become tumultuous, it can become difficult, and sometimes those things, actually, are beneficial in ways that you push each other creatively and kind of get around the obstacles," he says. "It&apos;s not that Vinnie said &apos;no&apos;; it&apos;s that it wasn&apos;t possible. Whatever other unit would be put together, it&apos;s not capable of creating the chemistry necessary to put on the show that Vinnie and his brother did." Adler&apos;s full conversation with Jericho can be listened to below. The portion where he discusses the Pantera reunion begins around the 24 minute mark.